The Community Players was founded in 1927, with a mission “… to encourage, foster and promote the participation by amateurs in all phases of the theatrical arts …”. We are proud of our long history of providing the capitol district with 88 seasons of the quality amateur productions. Click on one of the links below for more information on our history, and on joining the Players. The Community Players was founded in 1927, with a mission “… to encourage, foster and promote the participation by amateurs in all phases of the theatrical arts …” In those early years, we rehearsed, performed, and stored all our sets, props, lights and costumes at the Concord City Auditorium – an 800-seat municipal facility built in 1904. The Players produced three shows each year, with all profits going to local charities. Talk about non-profit theater…! Every fall the members of the Board of Directors and the Officers signed a note and borrowed money from the bank to pay the up-front expenses needed to start the first production of the season. And for all the work that went into each show, we did one performance only. All types of theater were presented: comedies, tragedies, classics, children’s theater, operettas… and in 1948, an original musical written by Alvah and Alison Sulloway of Concord entitled WINNER TAKE ALL. In 1949, our production of ALICE IN WONDERLAND, directed by Kurt Graft (of Meadow Hearth in Hopkinton), utilized the costumes originally used in the professional production directed by Eva LeGallienne. In 1956, local artist Mel Bolden designed and supervised the painting of our set for SABRINA FAIR. The role of Jerome, the planter’s son in our 1957 production of SOUTH PACIFIC, was played by John Adams, who would grow up to compose the modern opera NIXON IN CHINA. Then suddenly, in 1960, we were homeless. Though we continued to perform at the “Audi,” the city needed our storage and rehearsal space for other purposes. So we gathered up our costumes, our flats and platforms, our lights and our props, and for the next 37 years the Players became nomads. During those years we would move many times, to all sorts of temporary homes – an old church, a former bakery, at least three different warehouses, and even the Old City Waterworks complex. Many of these locations lacked adequate space and lighting. Some lacked running water. One even lacked heat (in New Hampshire, mind you)! Sometimes we only had room enough to store some of our belongings; costumes and set pieces ended up at members’ homes. Often we lacked rehearsal space, so we would work in church basements, retirement home function rooms … wherever kindly members of the community would take us in. The dream of owning our own studio began to take shape sometime in the 1970’s. But it was not until 1983 when that dream first showed signs of becoming attainable, with a generous gift of land from Liz and Dennis Hager. We began to clear the land in the summer of 1984, and soon poured a foundation – but work proceeded slowly, as we were determined either to do it ourselves or to hire help only when we had the cash on hand to do so. Construction finally got underway in 1991. In 1995, the Board of Directors voted to borrow the funds needed to finish the job, and with Brix and Stix Construction as General Contractor, and thousands of volunteer hours by members and friends of the Players, we finally had a home of our own … A Players’ Place. In May of 1997, we had an Open House Celebration in our own Studio/Workshop. The Workshop has made possible a vibrant and active Players organization the like of which the founders could scarcely have imagined. We still produce three mainstage shows each season at the City Auditorium, though we now offer three or four performances of each show. The Audi, incidentally, has undergone extensive renovations during the past decade – thanks in large part to the efforts of the Players and our sister organization, the Friends of the City Auditorium – and now boasts state-of-the-art lighting and sound systems, air conditioning, and a sumptuous new lobby. Alongside our mainstage season, the Players now sponsor a Children’s Theater Project, extending our mission to “encourage, foster and promote the theatrical arts” to the next generation of thespians. Founded in 1995, the CTP produces one major show each fall, and offers a children’s theater camp during spring break week. The Players also sponsored a Playwrights’ Workshop for aspiring authors of works for stage and screen. 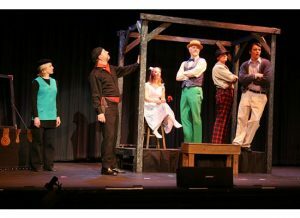 Since 1998, five staged productions (two musicals and three straight plays) have come out of this program. One of these – Kevin Barrett’s TARGETS – was named Best Original Play at the NH Theater Awards in 2003. First and foremost, however, the Players are a community organization. We have not forgotten the generosity of our friends who helped us through our “nomadic” years, and then answered the call when we solicited funds to help pay for our studio. We have not forgotten our audience, without whose loyalty we would not have survived to celebrate our 80th Anniversary in 2008. And so we strive to give back to the community which has given so much to us. The Players regularly lend costumes and props to schools and other theater groups. We make our lighting equipment available to other users of the Audi, and offer set-building and rehearsal space in our studio to various non-profit organizations. We sponsor an annual scholarship for a graduating Concord High School senior who plans to study theater in college. In 2004 and 2005, we collaborated on fundraiser variety shows with a community theater group from Manchester, NH – and we took a leading role in the celebration of the 100th Anniversary of the City Auditorium. In May of 1927 the Community Players presented our first show, THE MOLLUSC. That’s more than two hundred and fifty opening nights. Many hundreds of individuals have spoken, sung and danced on our stage over the past eight decades. And thousands of people have sat in the seats and watched and laughed and wept and applauded. We’re not saying we’re perfect. We’re not even saying we’re the best. But we are saying, “We’re still here after 88 years!” And as long as you buy tickets and come to the Audi, the Community Players will do their best to entertain you.